Guy MovingOn: When cooking meat, there really isn't any reason to go higher than 80C (175F). Back in the day I did a double-blind taste test between brined (7% NaCl soln for 48 hr) pork shoulder at 80C (175F) for 10 hours and at 70C (160F) for 24 hours: no one was able to tell the difference. Now, cooking vegetables at 80C (175F) may pose some problems. With (non-starchy) vegetables it is all about dissolving enough of the cementing material that holds the cells together to make them easy to bite. [The literature refers to this as the beta-eliminative degradation (or depolymerization) of pectic polysaccharides.] I usually dissolving these pectic substances at 85C (185F) --- others cook their vegetables at 83C (182F). You can cook starchy vegetables though, since most starches gelatinize by 80C (175F) --- I usually cook them for about twice as long at 80C (175F) as I would have boiled them. Its interesting that there's been almost no discussion through the whole thread on vegetables, pulses and grains. (Though upthread #3125 Dec 21 Douglas mentioned he was planning experiments on starch cooking.) There seem to be no vegetarian SVers. Anyhow, is this near-silence a tacit recognition that the SV method has no real advantages when it comes to plant-eating? I am not convinced that that the extra chore involved in bagging is worth it. Compared to the major effects of small temperature differences in cooking an egg, thanks to its several proteins, likewise also with meat and fish, temperature precision seems to be much less critical for carbohydrates. Sous vide is bit of a misnomer since a rigorous vacuum is not generally required. All that's needed is to squeeze out enough air so the bag doesn't float and there isn't a wide layer of air insulating the food from the water. Also, if you freeze it afterwards, the food avoids freezer burn. Another possible reason is to prevent the food in the bag from getting unwanted tastes from oxidization, though this may be moot because in practice with home vac sealers there's probably going to be some oxygen left in the bag. Instead of sous vide, the technique should be called something like "Low Temperature Precision Cooking" - but a mouthful like LTPC isn't going to catch on. Thank you Douglas! Now I'm even happier with my waterbath! I was just a bit worried as I saw many confit and vegetable recipes requiring 83+C temperatures, but thankfully my confit tasted amazing at 80C! I wanted to ask you two questions. I cooked some chicken breasts last night. In your guide you suggest a brine solution of 5%. I believe in some of the recipes in Under Pressure, Thomas Keller uses a 10% solution, and sometimes 10% sugar as well. Would there be a noted difference between the two? Furthermore how would the duration of time in the brine affect the meat? I was interested to see that poultry and eggs can be pasteurised at 57.5C, if held at that temperature for a long enough time. Is this the absolute lowest temperature at which pasteurisation can be achieved? Once again thanks for all your guys help! I have a very small joint of smoked gammon (about enough for 2 people). Can anyone suggest how to cook it? Brine? And if so, other flavourings in the brine? Temperature? And time once the core has come up to that temperature? thanks for the link. Really insane! But I wondered if I could heat a bath-tub with the FreshMealsMagic, so I filled it with 130L of hot tap water (as opposed to the 13L in the polycarbonate container that comes with the FMM) and started heating with the FMM and then ran an auto-tuning. And in fact, it works! 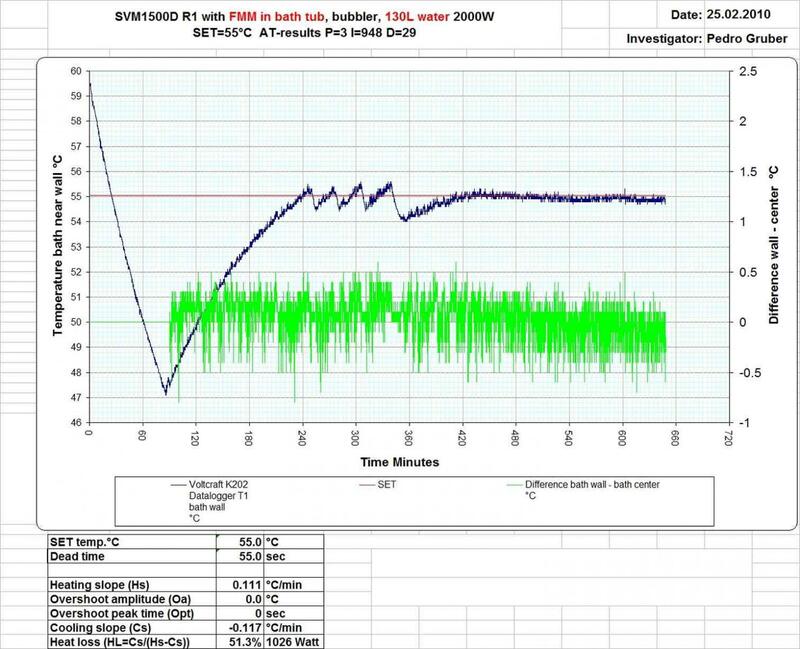 Heat loss is -0.117°C/min, and with full heating power, temperature rises 0.111°C/min. My FMM is 220V/2000W; with a 110V/1500W FMM heating will be slower, but it should hold the temperature. 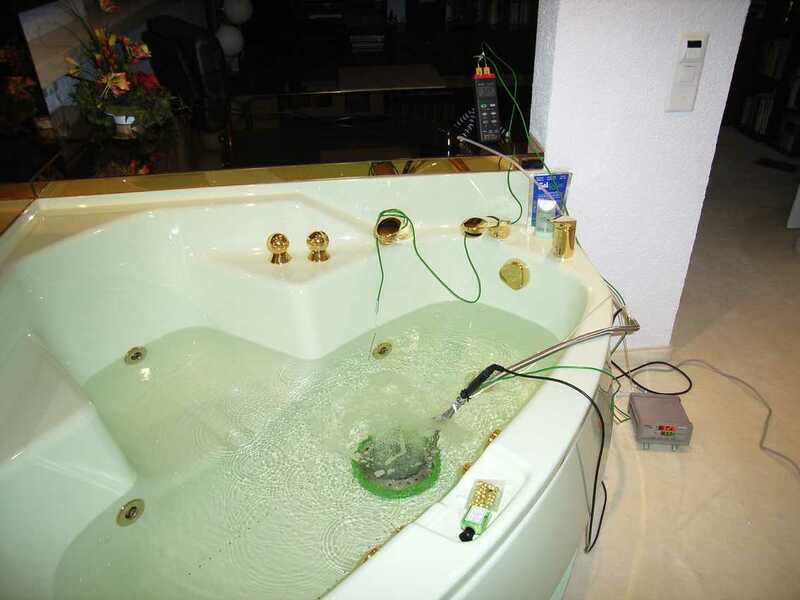 Temperature uniformity in the bath was within ±0.5°C. So if someone plans to do a suckling pig SV, FMM in bath-tub might do. 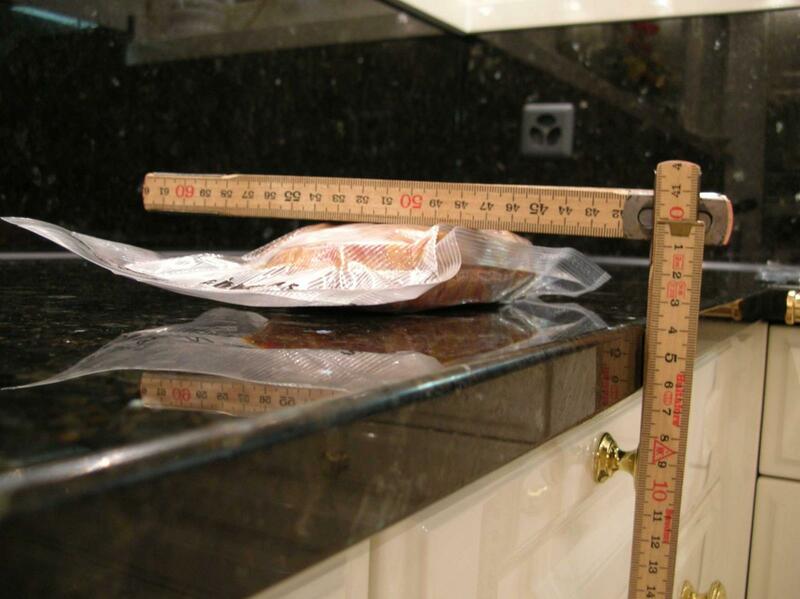 There are large plastic bags for storing and compressing e.g. textiles, which have a valve and can be evacuated with a vacuum-cleaner. A small suckling pig should fit. But I am definitely NOT going to cook a Trojan Hog! I imagine the suckling pigs get shipped vacuum sealed anyway...most sub-primal cuts are shipped that way to stores. You could just ask them to not take it out of the bag. Here I used D60C5.66C = 5.94 minutes for Listeria monocytogenes, a thermal diffusivity of 1.08 10-7 m2/s for poultry, and assumed the slowest heating shape (an infinite slab) at each thickness. Brining is always an interesting subject. For the last couple of years, I've only been brining meat that I cook well done: pork shoulder for pulled pork; duck and turkey legs for confits; brisket for corned beef; etc. I brine meat I'm going to cook well done to compensate for some of the water that is lost when the muscle fibers shrink longitudinally and squeeze out the water held between its thick (myosin) and thin (actin) muscle fibers. At least for pork, a brine of 7--10% NaCl gives the highest increase in water. But there is another reason to brine: coagulate the albumin before it can coagulate on the surface. This is often called salting out the proteins. This is why Mr Keller sometimes brines fish in a 10% brine for a short time. I tried bidding on the Lava V333, but even at £170 the Reserve wasnt met, and I didnt want to pay the £295 Buy It Now price. I've therefore just purchase the Foodsaver V2860 for £108.08 including delivery. Will report back upon using it! Wow thank you, I think next time I will try cooking chicken breasts at around 55C just as an experiment. Not sure if my girlfriend will like it, but I can just stick hers onto the griddle if she complains! Thank you for the brining information. I didn't realise duck legs can be brined before confit, I always thought they had a sort of salty dry rub instead. I had read, either in this thread, or in your guide, about brining fish before cooking to prevent albumen coagulating on the surface. So I guess it doesn't matter too much? Anything between 5-10% will provide a juicier result than if you had done nothing? I have a question about measuring the thickness from an infinite slab. If the slab above is our piece of meat. I presume that being an infinite slab, it is infinite along z. To measure thickness according to the tables, do we take x or y to be the thickness? In the case of a chicken breast, I guess the slab pictures above would be like a chicken breast on its side? It is "infinite" along y and z, the relevant thickness is the smallest dimension x.
Thickness refers to twice the shortest distance to the least accessible part of the food, "slab" refers to something between an infinite slab and 2 x 3 x 5 block, "cylinder" refers to something between an infinite cylinder and a 1 x 1 x 5 block, and "sphere" refers to something between a cube and a sphere. PedroG: That is a wonderfully illustrative picture. * Water activity (aw) is the vapor pressure of the food divided by the vapor pressure of water at that temperature. A long time ago, food scientists noticed that bacteria stop growing below certainly water activity levels; for instance, C. botulinum cannot grow if aw < 0.94 and Salmonella spp. for aw < 0.92. I haven't tried 55C/6hrs, I was stating a hypothesis; hopefully Guy MovingOn will let me know if my hypothesis was correct. I haven't had chicken at 57.5C/3hrs for several years; I remember enjoying it but my family being turned off by its appearance. While I almost always use my chamber vacuum sealer, I usually seal the breasts while they are frozen --- since they are frozen, even pulling the highest vacuum doesn't damage their texture. I have cooked chicken breasts @55C and the result was very good. I was cooking some beef ribs @55C for 48 hours (deliberately low to maximise the "rare" appearance) for a presentation a couple of weeks ago and decided at the (relative) last minute to give the audience a sample of chicken breast as well. I had a couple of fresh free range breasts in the fridge which were to be that night's dinner. I bagged them with a sprinkle of white truffle salt and white pepper using my normal SV pressure (97%) in my chamber machine. I cannot be sure of the exact vacuum which is pulled at that setting, but I find it is sufficient to extract enough air so that the bags easily sink. Interestingly freezing using that vacuum level tends to allow ice crystals to form in time whereas holding 99% for a few seconds does not. (Note that my machine only has a 2 digit readout so 99% really equals the maximum it can pull. Once you pull 99% you get an option to hold that pressure for a programmed number of seconds whereas at lower pressures there is no hold option). I found a digital pressure gauge which would let me know the exact vacuum pulled but at >$700 I can't quite see getting value from it. Anyhow I cooked the breasts for about 4.5 hours. The texture was a little softer than chicken from the same source cooked @58C for 2 hours, but it was still "al-dente" and not at all mushy. As for colour it was slightly pinker than the 58C breast, but it was not at all undercooked. The neophyte tasters all thought it was brilliant! For what it's worth, in my experience, this is an area where palates seem to have very different responses and one hust has to try at a variety of temps and find out what you like. I have tried chicken breasts at a lot from temperatures from 133F long enough to pasteurize to 160F for 30 minutes. My personal favorite is somewhere in the 138F to 142F range. I personally found the texture at 133F and 135F not quite as pleasing as that around 140F (and to let you know where I am coming from, I like my steak down in the region from 125F to 129F). I like them at the lower temps just not as much. When I have served chicken in the 130s, there have been a few people that were very lukewarm to it but I haven't had that response to it at 140 or so. At a given temperature, the texture seems to vary a lot more with chicken from source to source than it does with beef, pork and fish. I have no idea why that is, but that is what I have found anyway. I also am convinced that a couple of hours in a 5% brine does wonders for chicken cooked in any fashion. ... I bagged them ... using my normal SV pressure (97%) in my chamber machine. Yes we know that bags floating horizontally is not good. And yes, its good to get as much air out as you can. Though I'm sure that the last small bubbles aren't critical. But isn't it a worthwhile idea (at least for those without such chamber machines) to routinely use solid glass gems/nuggets/pebbles/cubes to add a little weight to the bottom of all bags to prevent any bag ever floating horizontally? These items are food-safe, non-tainting, cheap, re-usable, freezable, easily washable, can be blasted in the oven for as long as you like to sterilise them and then stored in a sealed sterilised jamjar. Since they need to be found and removed before service, maybe unusual colours (like blue) are a good thing! Its probably also worthwhile choosing those with a simple shape and a shiny-smooth surface for better sanitisation. But if you have a local floristry supplier, they should be cheaper than mailing ballast. why didn't I have this good idea before you?? Whenever I'm cooking something where it's impossible to extract sufficient air from the bag to prevent floating (e.g., cauliflower), I simply leave a "tail" on the bottom of the bag and use a heavy binder clip to attach a heavy weight. Down it goes and down it stays. And I don't have to worry about having a foreign object in the bag.